One of the great things about being back in the states for the summer has been rediscovering the library (thanks to Husband's initiative). I'm a kindle addict, so I have to admit that the actual books didn't entice me all that much, but I had completely forgotten about the huge AV sections. We've been checking out tons of dvds and even audiobooks, and it's been such a joy! 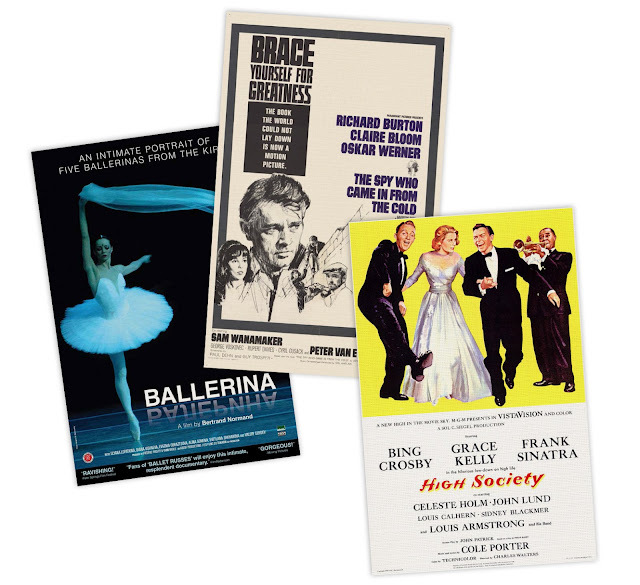 Here's a sampling of some of the wonderful movies we've seen this week: The Spy Who Came in From the Cold was a perfect moody spy flick with satisfying twists and turns, Ballerina tracks five dancers at different stages in their careers within the Kirov, and High Society was just plain fun (oh, and the dresses!). Do you regularly use the library? Have you seen any good films lately? I haven't been to the library in SO long, and it's a shame. I love the smell of all the books -- it's such a peaceful environment! Agreed! Possibly the only public space left today where there is total peace and quiet. I was in the library 4 days ago. i want to watch the ballerina i've read good reviews about it, my last week was all about watching movies i watched a little bit of heaven which is nice but sad, the hunger games, karate kid, Philadelphia, my name is Khan, and i don't know how she does it.